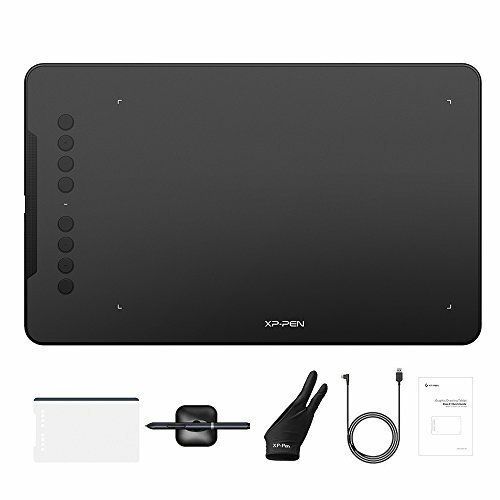 XP-PEN Deco 01 digital drawing tablet offers a large active area by 10*6.25 inch with 8192 level pressure sensitivity, enables artist to jot down the creative ideas in better precision and responsive. It’s in stylish design with ultra thin body at 8 mm and built-in 4 LED indicators at corners of active area. The lightweight design makes it both a great drawing tool for home and to-go. 【Smart and Stylish Design】Adopted the newest High Tech IC to make lines flow smoother and perform better. The Deco lights up on the ends of the drawing area, so you can create, even in the dark. ***Protective film is included to prevent the surface from scratches. 【More Sensitive, More Accurate】PN03 stylus technology provides 8192 levels of instant pen pressure sensitivity providing you with groundbreaking control and fluidity to expand your creative output. No charging required! 【No Boundaries for Creating】10 x 6.25 inch working area provides more space to create or get work done. The Deco 01's thickness is only 8mm, you can carry it anywhere without any burden. 【Shortcut Keys for Higher Efficiency】Designed for both right and left hand users, 8 fully customizable shortcut keys create a highly ergonomic and convenient work platform. 【Wide Range of Compatibility】Compatible with Windows XP/Vista 10/8/7, Mac 10.8 or above operating systems and most currently available drawing software, such as Photoshop, Paint tool Sai, Clip Studio Paint, etc. If you have any questions about this product by XP-PEN, contact us by completing and submitting the form below. If you are looking for a specif part number, please include it with your message.